A new documentary, The Limerick Soviet, which has been produced by Frameworks Films, the Cork based film production company in collaboration with the Limerick Council of Trade Unions will be shown at the Maldron Hotel, Cork as part of the Spirit of Mother Jones Festival on Friday evening 31st July at 5.30pm. This documentary tells the thrilling story of a workers rising in Limerick in April 1919 when a general strike was called by the Limerick United Trades and Labour Council. It followed the deaths on the 6th April of Robert Byrne, a local trade union activist and IRA member, as well as a member of the Royal Irish Constabulary, during an audacious escape attempt from custody by Byrne.As a result the British Authorities declared Limerick City a Special Military Area (SMA) whereby military restrictions would applyand permits were required to enter and leave. 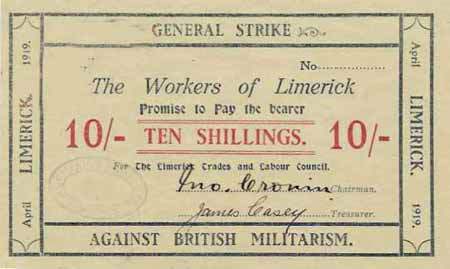 The Limerick United Trades and Labour Council refused to accept that the workers of Limerick required permits to come and go to work and declared a general strike. 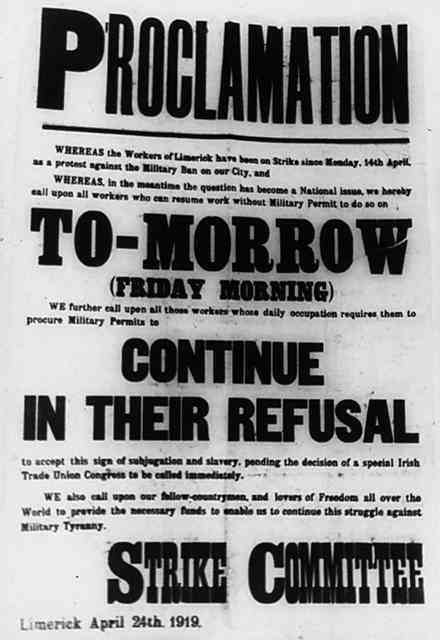 Some 14,000 workers answered the strike call on Monday 14th April 1919. The Strike committee took control of the city and as a self- governing committee declared itself a Soviet. 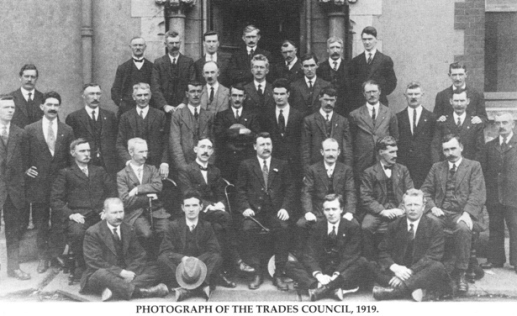 It was a highly effective, disciplined and a well organised operation under the leadership of John Cronin, a carpenter and Chairperson of the Trades Council. John Cronin and his committee organised and supervised the distribution of food, transport, communications and movement in the City and even printed its own currency during the period. The strike received unprecedented international media coverage owing to the presence of journalists covering an international air race. Eventually following negotiations and due to Church pressure and the lack of wider national union support, the Soviet decided on a full return to work by the 25th April and the SMA was abolished a few days later. The Soviet was remarkable in its organisation, in its general unity of workers and in the courage and solidarity of the workers and trade unions. The words of Mother Jones on her death bed could be applied to this Limerick Soviet in that the workers of Limerick “showed the world what the workers can do”. The Trades Council affirmed the right of workers to come and go from their employment without hindrance by the national authorities. It also displayed to the British Authorities and the Republican movement the potential power of organised labour and its potent force for action when provoked. Mr Mike McNamara President of the Limerick Council of Trade Unions along with the film makers Emma Bowell and Eddie Noonan of Frameworks Films will introduce the documentary at the Spirit of Mother Jones Festival. It will be followed by an open discussion. It takes place at the Maldron Hotel in Shandon on Friday evening 31st July 2015 at 5.30 pm.